True confession – I’ve been itching to write this blog! I love to bring everyone up to date on the happenings Up North, it’s finding the time I’ve been struggling with. But I’m the floor time agent on duty today, and as of 10:17am my to-do list is done and I have the rest of the day to write. Come to think of it though, I think I prefer the term ‘house mouse’ to floor time agent, a nickname given by a client and friend who retired from the Chicago Police Dept. I bet he’s had a few turns as the house mouse/agent on duty in quite a different environment than this, my cozy little real estate office in the Northwoods! And bonus, it’s National Pet Day and this is a dog-friendly office. 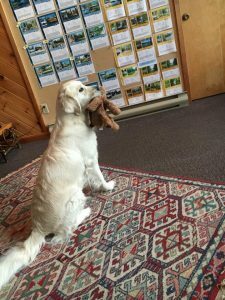 Lacy is ready to bird-dog your next property! 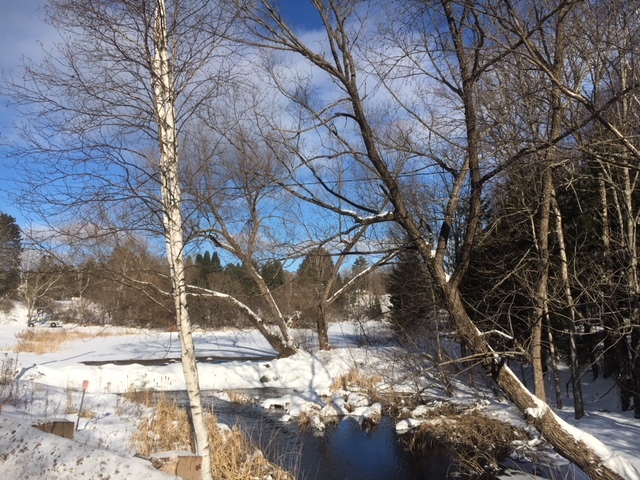 I have a new system for producing blog material that is proving to be fun and fruitful, just snapping photos as I trot around the area to serve as inspiration later. 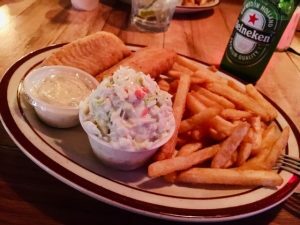 Basically it allows me to photograph fish fries, my all-time favorite activity, whereas I was previously looked down upon for doing so (mostly by my teenagers). The hope is that I may weave these tidbits into a good little story, the risk is it will end up a hodge-podge that makes no sense, like corralling kittens. We’ll see. Per usual we flew to and from Chicago to Ironwood, MI for our connecting flights because I refuse to ruin my entire vacation by ending it with a airport hotel stay and/or a 6.5 hour drive back up the entire state of Wisconsin, which I just spent good money to forget that I live in. Rain, freeze, snow, melt, repeat. This fish fry called for special celebration because it was the first time I felt glad to be home and back in my element. Vacation is wonderful but it does jar you a bit, at least it does me. There’s the laundry and the cleaning and the dealing with whatever blew up in your absence. 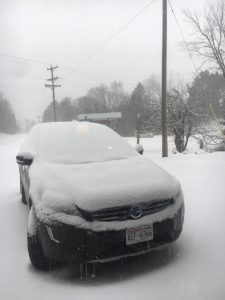 Even the convenient drive from the airport in Bessemer was somewhat depressing. Grandpa Jim’s favorite topic of discussion are the dreaded HOA (homeowners association) fees in Arizona, because he does not believe in them and craftily does not have one, unusual for that area. On our late-night drive back home through the UP and Presque Isle I wondered how an “HOA” would go over here, where inoperable campers sit under four feet of snow in people’s front yards, whilst you can’t even keep an operating camper in Grandpa’s driveway! 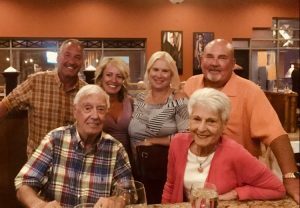 HOA-less Grandpa Jim, the lovely Dorie, Mark and I, and our AZ friends Steph and Mike Mulleady at Arrivaderci! Happy Hour is big in AZ, I think we need it in the northwoods. But a hot fish fry and fast service at the PI Pub (thanks to the quietest time of the year up north) and suddenly I was content to be back home in the land of melting snow and ice. Most restaurants and shops close for a stretch in April, and finding open eateries is a crap shoot this time of year, so I’m thankful that the trusty Pub never closes. It occurred to me that a good blog topic in April might be Who is Still Open? It would be a short blog, basically the Pub and Karsyn’s Korner mini-mart. I do love our little town, even when it’s not open it’s still open, if you need something after hours they’ll likely leave it out for you. Not ‘technically’ open but they’ll leave ice out for you…pay us later. And yes, I should mention the weather, in that today is the day we are supposed to get a whopper of a snow storm, and yes it’s already coming down and yes everything is white and no I don’t know how much snow we’re going to get and no I don’t know if it will ever stop. I blame my son Aidan for removing his snow tires too early. I’m just glad there is wood left in the pile, propane in the tank, and the makings for soup thanks to the last batch of frozen zucchini from our nearest year-round neighbors across the bay. They owned and operated a greenhouse for many years and have an amazing garden, the abundance of which they share with us…how’s that for lucky? 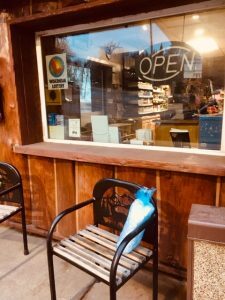 We’re also members of the Northwoods Farm Share community, which includes product from Three Sons Pork & Greens, Hillbilly Hollow and other local farmers. We order from a website and I pick up our goodies after yoga, every Wednesday night in Mercer. It has been wonderful to have fresh produce this time of year, and I’ve also gotten into the habit of ordering the Mystery Item every week, because who doesn’t need a little mystery in their life? 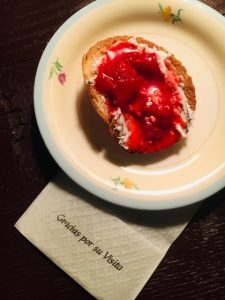 This week was a dessert cookie, with an herb cheese spread and a strawberry topping. A treat I never would have thought of buying for myself, but OMGsh did we enjoy it. I made some for my jet-setting daughter, who was kind enough to stop at home on her layover from Minocqua, WI to Raleigh, N.C. where she was visiting a friend and attending a music festival. Thank you for your visit Miss Estelle! As far as the real estate world is concerned, I have good reason for wanting the snow to melt, because listing season is around the corner! I am tingling with excitement at the properties I’ve been seeing. 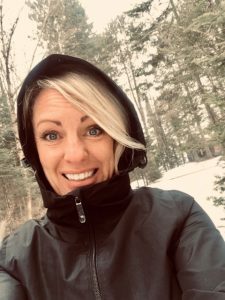 My favorite aspect of northwoods real estate is definitely the exploring, especially this time of year…snowshoeing down an impassable driveway, checking out the shoreline, finding the lot lines in the woods (and watching the deer scatter) are all parts of my job that I love. Even better if I’m alone, which is per usual. The silence is golden. Selfie on a snowy, silent walk. 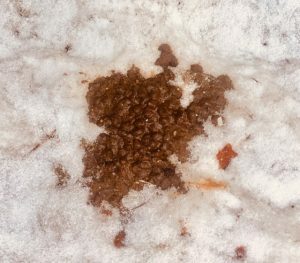 I hope that’s deer poop…how long do bears hibernate? 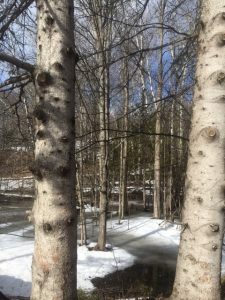 As soon as they have access, I will be listing a cabin on a beautiful acreage parcel on Oxbow Lake that if you ask me, was probably one of the choicest offerings on the lake way back when, with a ripple sand beach and one of the prettiest views I’ve ever seen. The cabin is rudimentary (we call it ‘charming’ in the biz) but oh, you can just feel the love from the family photos on the wall, the game table with years of rummy scores and the proudly displayed walleye mount above the fireplace. Welcome home to life on Presque Isle Lake. 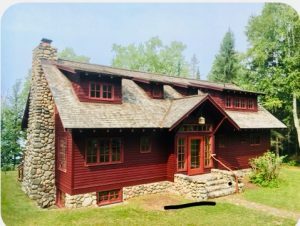 Then there’s this beauty of a home on Presque Isle Lake, with cobblestone paths and a post and beam interior, and a traditional screened porch that overlooks big water and sunset views. My heart actually skipped a beat when I first stepped inside, it is honestly that sweet. Such an honor to represent these families and their homes, to witness their history and help pass it on to another family. 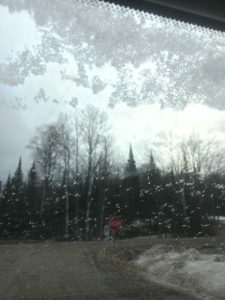 Ah but patience is a virtue, for the time being it looks like there is still snow to shovel and ice to melt. No sense crying over spilled milk or April snowstorms, just do your best to clean up I guess. 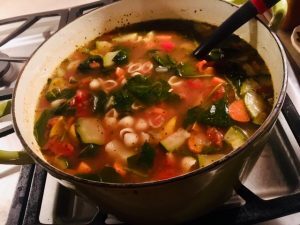 Another night to hunker down, build a fire and enjoy some soup. Before we know it the call of the loon will herald the beginning of another season, for the scenery is always changing here on Almost an Island, where life is good.